This dataset contains more than 60 indicators concerning various aspects of land use (such as Country area, Agricultural land, Arable land, Forest land, Agricultural area certified organic, etc...) as provided by the Statistics Division of FAO. 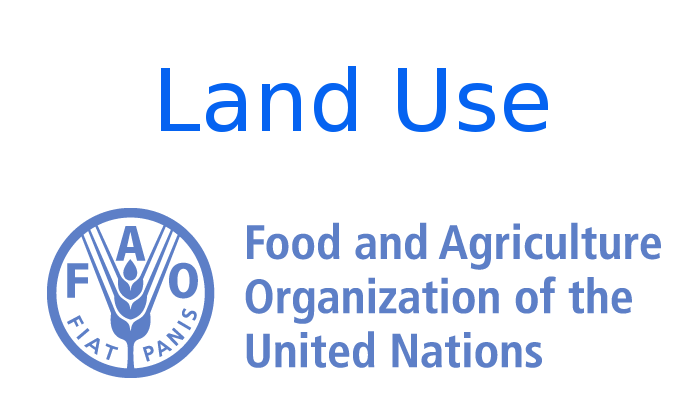 Additional information are available on FAOSTAT, under the Land Use domain. Area of the country (1'000 Ha) including area under inland water bodies, but excluding offshore territorial waters. Land used for cultivation of crops. The total of areas under ''Arable land'' and ''Permanent crops''. Land used for crops with a less-than-one-year growing cycle, which must be newly sown or planted for further production after the harvest. Land that is not seeded for one or more growing seasons. The maximum idle period is usually less than five years. This land may be in the form sown for the exclusive production of green manure. Permanent meadows and pastures is the land (1'000 Ha) used permanently (for a period of five years or more) for herbaceous forage crops that are managed and cultivated. Permanent meadows and pastures - Naturally growing (1'000 Ha) is the land used permanently (for a period of five years or more) for herbaceous forage crops that is naturally growing. Share (%) of Agricultural Land with respect to the Total Land Area. Share (%) of Arable Land with respect to the Total Land Area. Land spanning more than 0.5 hectares with trees higher than 5 metres and a canopy cover of more than 10 per cent, or trees able to reach these thresholds in situ. Land used for forestry. Excludes land that is predominantly under agricultural or urban use. Naturally regenerated forest (1'000 Ha) where there are clearly visible indications of human activities. Forest (1'000 Ha) predominantly composed of trees established through planting and/or deliberate seeding. Naturally regenerated forest of native species (1'000 Ha), where there are no clearly visible indications of human activities and the ecological processes are not significantly disturbed. Share (%) of Forest Land with respect to the Total Land Area. Other land (1'000 Ha) is the land not classified as Agricultural land and Forest area. It includes built-up and related land, barren land, other wooded land, etc. Waters located in between the land territory and the outer limit of the territorial sea. Agricultural land under cropland that is actually irrigated. Forestry land area that is actually irrigated. Land area equipped for irrigation that is actually irrigated in the reference year. It covers both fully controlled and partially controlled irrigation. Land area equipped with irrigation infrastructure and equipment to provide water to crops, which are in working order. The equipment does not have to be used during the reference year. Agricultural land area under permanent meadows and pastures that is actually irrigated. Cropland area under organic agric. Cropland area on which tillage practices leave plant residues (at least 30-35 percent) on the soil surface for erosion control and moisture conservation. Cropland area certified organic and/or in conversion to organic. Cropland area on which practices do not involve any tillage operations. After the seeding operation, not more than 25 percent of the soil surface is allowed to be disturbed. Sum of areas (1'000 Ha) under “Permanent meadows and pastures area certified organic” and "Permanent meadows and pastures area in conversion to organic”. Part of the area (1'000 Ha) of the "Permanent meadows and pastures" exclusively dedicated to organic agriculture and managed by applying organic agriculture methods. Area of Coastal waters used for marine aquaculture facilities including supporting facilities. Area of Coastal waters that is used for catching aquatic animals or gathering aquatic plants in the wild. Area of the Exclusive Economic Zone (EEZ) that used for marine aquaculture facilities including supporting facilities. Area of the Exclusive Economic Zone (EEZ) that is used for catching aquatic animals or gathering aquatic plants in the wild. Inland water areas that are used for aquaculture facilities including supporting facilities. Area of inland waters that is used for catching aquatic animals or gathering aquatic plants in the wild. Land used for aquaculture facilities and fish-farming activities. Cropland area under a permanent structure with a roof of glass, plastic or other material, used for protecting crops against the weather, pests or diseases. Part of the area (1'000 Ha) of the "Permanent crops" exclusively dedicated to organic agriculture and managed by applying organic agriculture methods. Part of the area of the "Permanent crops" (1'000 Ha) which is going through the organic conversion process, usually two years period of conversion to organic land. Sum of areas (1'000 Ha) under “Permanent crops area certified organic” and "Permanent crops area in conversion to organic”. Part of the area (1'000 Ha) of the "Permanent meadows and pastures" which is going through the organic conversion process, usually two years period of conversion to organic land. Water withdrawal for agricultural use as a share (%) of total water withdrawal by country.